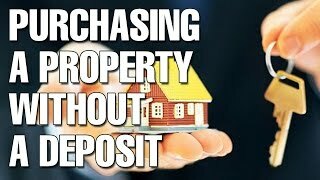 You CAN purchase a property without a deposit in Australia. Here are 5 options you can if you want to purchase a property with zero deposit. Now Tracy there are options out there but they are, what’s the best word, tricky I guess to say. The two major options and depending on what states you’re in, depends on whether or not it’s actually legal cause I think, I know South Australia I think owner finances are legal but you need to check into your particular state and what’s legal in that state. But there is owner finance and leasing to buy and let’s look at owner finance first because that’s more common and it’s probably the safer thing to do. Owner finance is when rather than you going to the bank or to a lender, getting a loan, receiving that loan in cash and giving that cash to someone to buy their property, you just get rid of the lender altogether and you talk to the owner of the property and the owner extends a loan to you. So let’s say a property is worth $300,000, you may say to the owner I will buy it off you but rather than paying anything upfront I’m going to assume a loan with you of $300,000 at 7% or 6% or 5% whatever. You can negotiate; you can make it what you want to make it be. You draw up contracts, you do all the legal stuff so that it’s legal. You then take ownership of the house. I’m pretty sure the title will remain with the original owner because you haven’t fully paid them just the way like the title remains with the bank or a lender until you fully pay it off. So basically the old owner, you then treat them as your lender, you pay them consistently on a consistent basis, you pay your mortgage, eventually you’ll either pay them off you will after a couple years most people then go to a traditional lender and say, hey look I’ve got this property, I’ve been paying my mortgage on time, I’ve got some equity cause the property’s gone up in value, how bout you give me a regular loan? The banks go, they look at you, they go, “Look at this, you’ve been paying on time, you are awesome. I’ll give you a loan,” and then you take that lump sum and then pay out the original owner. So that’s owner finance in a nutshell. That’s one way of purchasing a property without a deposit. Now in a fast moving market finding someone who’s willing to do owner finance is not super easy. There are companies out there that do owner finance as their business so you could potentially look at one of those. I would simply go into Google and I would search owner finance properties or something like that or go to nextplace.com.au, they have a search tool and search owner finance there and see what comes up but you’re going to be extremely limited in what properties you buy. The other method is a lease to buy method and what this means is that you assume a lease on the property and you go in and live in it and you haven’t purchased the property but you’re paying extra rent. So rather than a market rate of $400 a week you might be paying $600 a week and so $400 is like normal rent and then $200 per week goes towards a deposit on this property; and once you’ve lived there long enough and you’ve accumulated this deposit of money you then have the option to buy that property. Everything I’ve heard about these lease to own properties are really in the benefit of the person selling it because so many people default on it and then the seller gets to keep the extra money. So you’re paying extra rent and then if you have to default, you have no way of getting that extra money that you’ve paid back because the money is just a security on that one property. It’s not money that you have in a savings account that you can take anywhere. So a lot of, maybe not a lot, but I have heard of some sellers taking advantage of people using this strategy so just because of what I have read, it’s not something that I would do. I would try and negotiate, go down the owner finance road. If you can either by finding a company that does it and will accept no deposit or finding some seller who likes the idea of owner finance or maybe they’re in a desperate situation. They’re property can’t sell and so they’re willing to accept other offers. Obviously you’re going to be so limited in what you buy and if you’re buying from a desperate owner then maybe higher levels of risks associated with that. So you do need to do your research first, you need to make sure that the property you’re getting is one that you understand what type of property it is but from my knowledge, they’re the two ways to do it. Other ways to do it which I’m not actually sure how they work or if they work is there’s property options. So this is, you go to someone and say, “I’m going to pay you $1,000 or $2,000 for the option to buy your property at this set price in the next five years and so just like you do options in stocks which you may be familiar with or not but basically you have the ability if you want to exercise that option which means you can buy a property, you can buy the property at that price. So what now could happen is that property goes up in value and it goes up in value beyond the price that you have the option for; well that difference in an actual value of the property and the option that you have may mean that you can get a loan without paying deposit because the equity becomes a deposit. But most lenders will value your property either at its value or at where you’re paying for it, whichever is lower. So you do need to find a lender who‘s going to help you out there. The other thing you could do and again you need to find a lender that you could do this with would be to agree to a property but to have a long settlement period. Maybe it’s three months, maybe it’s six months and to get in your clause early access to the property and so maybe you would sign off on a dilapidated property, you would get early access to it, you would then go in and you would do all the renovations and stuff like that using your own money and then you would get that property revalued before you signed your contract. You would then need to, hopefully the property’s gone up in value and you would then need to find a lender that would accept the equity as a deposit. So that’s the, there’s not only four ways that I know of that you could purchase a property without a deposit, actually there’s one more and that’s guarantor loans. So banks now have these family pledge loans which allow you to purchase property without a deposit. So what this means is you go in, let’s say you have no deposit at all. The banks will provide you a 100% loan as long as you got someone to come in and guarantor you. The thing that makes them different about guarantor loans from the past, is that the guarantor used to be responsible if you default and then disappeared, they’d be responsible for all of your loan, 100%. Whereas now, they’re responsible only for anything that falls above or below the 80% loan to value ratio. So if you take responsibility for all of it, but if you disappear and don’t pay it, they’re responsible for the 20% and then the bank I guess becomes responsible for the other 80%. So it’s good because it means they’ve got limited liability in the situation and then you can get your property revalued at a later date and if the property’s gone up or you’ve paid it down, you can get that guarantor removed from the property. So there you have five different ways you can potentially purchase a property without a deposit. It’s not easy, you are going to either need to do hard work with options or with owner finance to find a property that’s suitable or you’re going to need someone to vouch for you through guarantor loan or something like that. But I hope that this has helped answer your question. If anyone else out there has any other questions, please email me ryan@onproperty.com.au or go to my website onproperty.com.au/contact and you can fill in the contact form there. I’m getting through these questions, getting tired. I just did three back to back in a row non-stop. So I’m going to keep powering through these, if you send me a question I guarantee you that I will answer it in a video. That is my guarantee. I’ve about 30 or 40 to get through and I’m loving it. This is such a good way to create valuable content because I don’t have to guess what you guys are asking, you literally ask it and I just try my two cents. Look I really appreciate you take the time to watch this and listen to this and give me your attention and I thank you so much for everyone who signed up onproperty plus and is a member there and everyone that has become and everyone that has signed up for my self-leasing kit in the pre-launch. I really appreciate your support. If you are interested in a self leasing kit and you want to lease your own investment property yourself without a rental manager, go to leaser.com.au now that’s spelt L E A S E R.com.au like a lease and then with a r at the end rather than like Lisa from The Simpsons, so leaser.com.au. Pre-launch 50% off, $14.95 for that kit. If you sign up before pre-launch and then we’re going to launch it on the 1st of October. Looking forward to that, had some huge interest in this product, super exciting. I’ll probably do a podcast which explains in detail exactly what it is at a later date. Alright, I will leave you there, now I’m just rambling. Until tomorrow remember that your long term success is only achieved one day at a time.